Anyone who has ever suffered from a kidney stone will say the discomfort and pain is very uncomfortable, and that these kidney stones can be a true hassle to eliminate from the body or dissolve. While not everyone will get a kidney stone in their lifetime, knowing how to treat a kidney stone when it occurs can help you dissolve the stone before it gets very large or travels too far in the urinary tract. Luckily, apple cider vinegar is a fine natural remedy for removing and dissolving kidney stones, and taken properly can have fantastic results for you when you need relief from painful and disturbing kidney stone afflictions. What Are Kidney Stones, and What Causes Them? Kidney stones, in essence, are accumulated crystals that form in the bladder or kidneys, and are comprised of minerals the body natural contains and expels on a normal basis. These crystals and minerals normally pass through the kidneys and exit through the bladder with no issues at all, but in some people can actually form into hard ‘stones’ that can get lodged in the urethra as they grow and travel through the body, looking for an exit. It is when these stones are on the move that people notice the discomfort these stones can cause. Kidney stones are often caused by a sedentary lifestyle and a lack of proper hydration. While other factors can play a role in kidney stones, including medical conditions, medications, and even hereditary issues, a lack of water consumption and failing to exercise minimally every day can make you more susceptible to kidney stones. 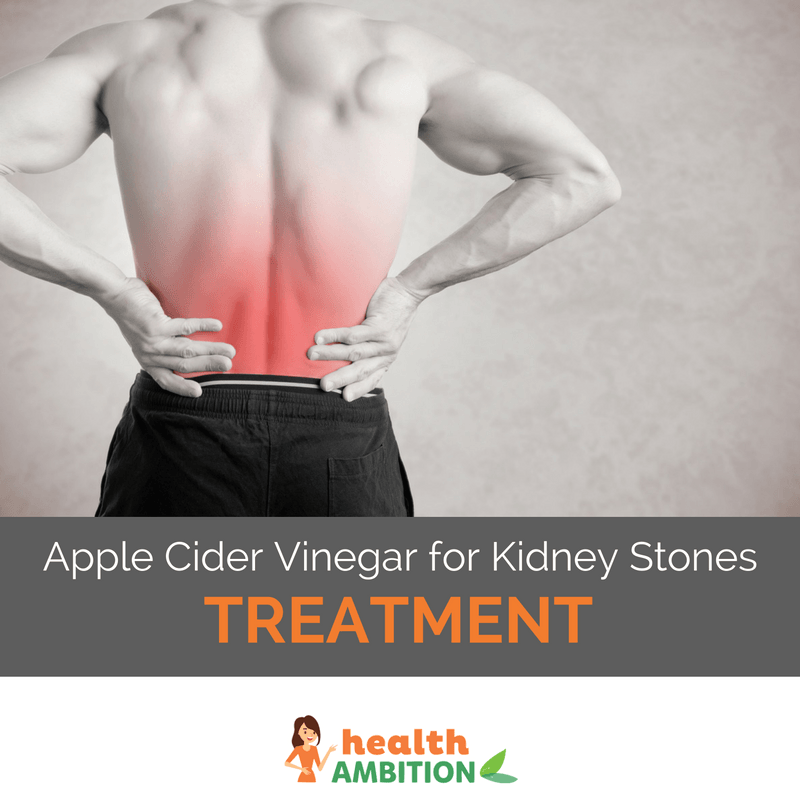 Luckily, however, many natural remedies, including apple cider vinegar for kidney stones, prove to be very helpful in helping you rid your body of these painful stones once and for all. You will recognize a few symptoms as your kidney stones get larger. The main symptom you will feel is pain in the groin area, abdomen, or even back (kidneys), depending on where the kidney stone is placed. Another telltale sign of a kidney stone is blood in the urine when going to the bathroom, or a painful or broken stream when attempting to urinate. These symptoms are often similar to a urinary tract infection or a bladder infection, so having a kidney stone properly diagnosed by a medical professional is the best way to ensure it is treated properly before the pain gets even worse. You can begin using apple cider vinegar for kidney stones prior to visiting the doctor, but make sure you have diagnosed the issue properly so you can make sure it doesn’t get worse. Here’s a video showing more of the signs & symptoms. How Does Apple Cider Vinegar Work to Get Rid of Kidney Stones? How much apple cider vinegar for kidney stones is needed varies depending on the severity, size, and how long in existence a kidney stone actually is. That being said, a kidney stone can be easily dissolved by consuming apple cider vinegar on a daily basis. Apple cider vinegar works to reduce and dissolve kidney stones by helping to flush out the body from dangerous excess toxins, including the minerals that form into kidney stones. The high acidity level of apple cider vinegar actually helps to break down the hard tissues that make up the kidney stone, making it easier to pass (if it is large) or eliminating it completely by dissolving it in the case of smaller stones. The key in using apple cider vinegar to treat kidney stones is consistency. You should take apple cider vinegar every day with lots of water until the stone is completely dissolved, or the pain from the kidney stone (and accompanying issues while urinating) goes away completely. A common rule of thumb for consuming apple cider vinegar is to drink 2 tablespoons of it once a day in an 8 ounce glass of water, and consuming ample amounts of water throughout the day to help flush out the kidneys. Apple cider vinegar and kidney stones relief should become prevalent within 24 to 48 hours when taken correctly, and bring relief to kidney stone sufferers quickly. Another way to use apple cider vinegar to treat kidney stones is to soak a rag in warm apple cider vinegar and placing the rag directly on your skin surrounding the painful area, such as the groin, stomach, or back. This topical application of apple cider vinegar helps to dissolve the kidney stone on the outside, and works especially well when paired with consuming apple cider vinegar internally. While apple cider vinegar for kidney stones is certainly beneficial, the best cure is prevention. Keeping an active lifestyle can help the kidneys function at full speed, which allows them to flush out the excess minerals that form painful kidney stones in the first place. Also, consuming at least 8 cups of water a day helps keep the kidneys in top form and allows them to always be working to rid the body of fluids, thus keeping kidney stones at bay. Apple cider vinegar can be consumed on a daily basis whether kidney stones are present or not to help prevent further stones from forming. A healthy diet is beneficial as well in preventing kidney stones, studies and experts suggest. What works well is a diet that includes healthy carrot juice as a remedy for preventing kidney stones. Maintaining a healthy diet that is low sodium, high fiber, and lower in fats can help a person maintain a healthy body weight and energy level, which is all around healthy for the body and can help prevent kidney stones now and in the future. Kidney stones are a painful reality for many people, but there are many natural remedies you can use to help yourself get rid of kidney stones and prevent their reoccurrence in the future. In drinking apple cider vinegar on a daily basis and consuming lots of water throughout the day, you can rid yourself of the nasty kidney stones that cause them discomfort and pain, and can allow your body to have a healthier and more comfortable lifestyle. Apple cider vinegar for kidney stones is an effective and quick way for helping anyone feel more comfortable than ever in many ways. Thanks Mark for sharing your ideas to the public. You are a blessing to many. God bless you. Another way to use apple cider vinegar to treat kidney stones is to soak a rag in warm apple cider vinegar and placing the rag directly on your skin surrounding the painful area, such as the groin, stomach, or back. This topical application of apple cider vinegar helps to dissolve the kidney stone on the outside, and works especially well when paired with consuming apple cider vinegar internally. I don’t think this will work.I think drinking it would help,but not the rag part.